So many of the great soul singers of the 1960s and 1970s—from Gladys Knight to Sam Cooke to the Queen of Soul Aretha Franklin—received much of their musical training in the African-American church. And Betty Wright was no exception. Born Bessie Regina Norris in Miami on December 21, 1953, Wright was a pre-teen when she performed with her siblings in their gospel group the Echoes of Joy in the late 1950s and early 1960s. But like Knight, Franklin, Cooke and many other African-American singers with gospel backgrounds, Wright ended up shifting her focus to secular music—and when she was 12 in 1966, she recorded her secular R&B single, “Paralyzed,” for the Miami-based Deep City Records. Wright’s commercial breakthrough came in 1968 with the release of her debut solo album, My First Time Around, by Atco Records and her single, “Girls Can’t Do What the Guys Do.” At 14, Wright watched “Girls Can’t Do What the Guys Do” climb to #15 on Billboard’s R&B singles chart in the United States and #33 on the Billboard Hot 100. And she still wasn’t enough to vote when, at 17, she recorded her 1971 smash “Clean Up Woman”—which soared to #2 R&B in Billboard in the U.S. and #6 on the Billboard Hot 100 and sold more than 1 million copies. Other hits followed, including “Babysitter” in 1972, “It’s Hard to Stop (Doing Something When It's Good to You)” and “Let Me Be Your Lovemaker” in 1973, “Secretary” in 1974, “Shoorah! Shoorah!” and “Tonight Is the Night” in 1975. In fact, two different versions of “Tonight Is the Night” became hits for Wright: the original studio version from 1975 was a #28 R&B hit on Billboard’s R&B singles chart, and the live version from 1978 rose to #11 on that chart. But by the end of the 1970s, there was trouble in paradise: TK ran into financial problems, and Wright ended up moving to Epic Records—which, in 1981, released this self-titled album. Betty Wright was not a major departure from her albums for Alston/TK, and she still thrived on a blend of exuberant dance/funk numbers and romantic suol ballads. 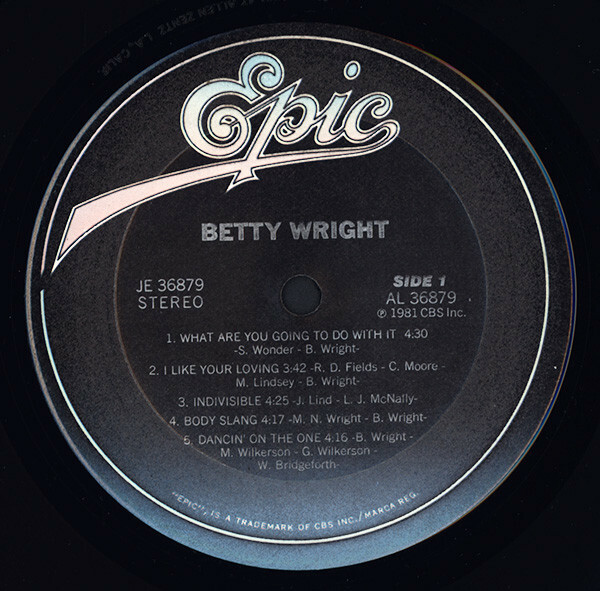 Betty Wright is best known for the single “What Are You Going to Do With It,” an infectious gem written and produced by Stevie Wonder. A minor hit, the song peaked at #42 on Billboard’s R&B singles chart in the U.S. The rest of the album was produced by drummer Andre Fischer of Rufus & Chaka Khan fame, and an impressive list of musicians join Wright—including Phyllis Hyman, Cheryl Lynn, Teena Marie and Bobby Caldwell on background vocals, Kim Hutchcroft (a member of the band Seawind at the time) on saxophone and Tito Jackson (of Jackson 5 fame) on guitar. Some of the participants have strong jazz credentials, including saxophonist Ernie Watts, vibist Victor Feldman and bassist Jimmy Haslip (a founding member of the jazz-rock fusion band the Yellowjackets). “One Bad Habit (And That’s Loving You)” was written by the late Richard “Dimples” Field, who also co-wrote “I Like Your Loving.” Field was an intriguing singer whose material could be pessimistic, melancholy and world-weary or dark-humored (“Your Wife Is Cheating On Us”), but he also had a spiritual side to his work—at the end of his 1982 hit “If It Ain’t One Thing, It’s Another,” Field followed a long list of complaints about the state of the world with a spoken monologue in which he encouraged listeners to check out the Bible if they were looking for some answers. Although Wright enjoyed her greatest commercial success during the 1980s, she has kept busy in the 21st Century as a singer, songwriter, arranger and producer. The 2000s found her working with younger artists such as Keyshia Cole, Kelly Clarkson, Lil Wayne and Joss Stone. And in 2011, Wright collaborated with Philadelphia-based alternative rappers the Roots on their album Betty Wright: The Movie—which had a hip-hop-influenced neo-soul outlook but was still quite faithful to her soul and gospel roots. Wright, now 62, is a soul survivor. The Miami native has built a rich and rewarding catalogue over the years, and 1981’s Betty Wright is among the many solid albums she can be proud of.